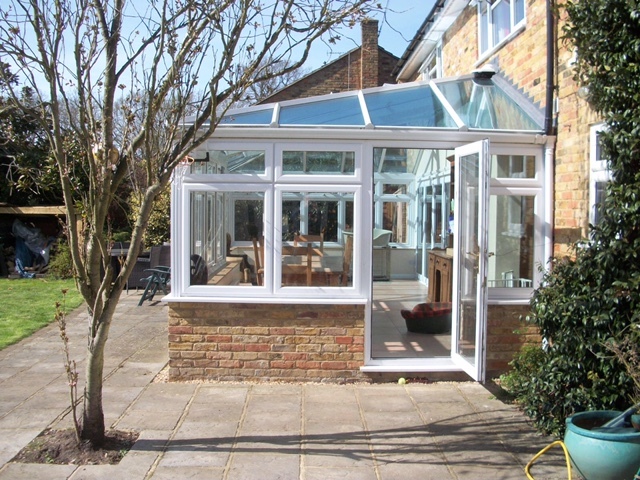 Expertly installed uPVC conservatories in Epsom and throughout Surrey. If you are looking to increase the space inside your home in Epsom, installing a conservatory is the perfect option for you. With a range of customisation options and a variety of benefits, your home is guaranteed to be enhanced with this installation. We pride ourselves on providing the best product at an affordable price, making it a worthwhile investment for your home. Utilising the latest technology, we are able to provide you with a high-performance product that is guaranteed to last for many years. Your conservatory is designed and manufactured to ensure your Epsom home is as thermally efficient as possible. With slim sightlines and double glazed glass panels, natural heat from the sun is guaranteed to be trapped inside your home, making it warm and comfortable all year round. Choose from a range of customisation options to ensure your conservatory matches the interior of your Epsom home, as well as its architecture. Our range of colours will enhance the look of your home. Using the latest technology, we are able to make sure your home is safe and secure no matter what time of year. Each conservatory lock is rigorously tested to make sure it is perfect for your home. We pride ourselves on offering our customers with the best quality product at a competitive price, ensuring you aren’t over-paying for your home improvement needs. Our team of highly skilled experts are on hand to ensure your conservatory is delivered and installed on time, without the need to reorder. With our highly-skilled experts fitting your chosen extension seamlessly, you can start seeing the benefits instantly. We offer a large range of uPVC conservatories, which means no matter what size or shape your home is, you can be sure to find one that fits the aesthetic of your Epsom home perfectly. Utilising the range of customisation options, you will be provided with a bespoke extension to make the look and feel of your home. The extensive range of colours and finishes are guaranteed not to rot, warp or discolour, giving you years of enjoyment. Using the latest technology and high-quality materials, your home will instantly benefit from the installation of a bespoke conservatory. The unique materials used ensure you won’t have to spend all of your spare time scrubbing it clean. With a quick and regular wipe of a cloth, your conservatory will be kept looking brand new. With minimal upkeep needed, it is easy to keep it looking its best. Inspired by beautiful Victorian architecture, the Victorian conservatories we offer are perfect for creating a more traditional look to your home. With its multi-faceted design, your home will benefit from increased natural light and space. If you are looking for clean lines and sophisticated style, the Edwardian conservatory is perfect for you. The symmetrical lines and flat surfaces will give your home a clean, polished look that cannot be replicated. Modern, sleek and stylish. The lean-to style is perfect for those wanting to update their home, making it more contemporary. Using an angled roof, your home will benefit from reduced risk of water ingress, as well as increased space and light. Give your home a luxurious feel with the installation of a gable conservatory. Its vertical roof design and tall, sturdy structure make it perfect for any type of home, and is guaranteed to last for many years, withstanding the toughest weather conditions. Offering more space, more light and more character than a conventional conservatory, the P-shaped option carries a host of added benefits for you to enjoy. This unique shaped extension combines the best elements from the lean-to and Edwardian styles. Much like the P-shaped option, this unique shape combines the best features of the lean-to and gable conservatories to provide you with a versatile, contemporary space that can be used for a multitude of purposes. Increase the privacy of your home by installing a roof lantern. They are guaranteed to be strong and sturdy, increasing the thermal efficiency of your home whilst also enhancing the natural light. Keep your conservatory bright and create the illusion of more space with our roof lanterns. You can receive a tailored quote in moments with our online quote engine. This easy to use design tool allows you to create the perfect conservatory and see our amazing conservatory prices. To hear more about the range of uPVC conservatories we have on offer, give us a call on 01737 360 841 and a member of our team will be happy to guide you through the extensive range. Our team of experts will be on hand to answer all your questions and give you a quick quote. If you are short on time, you can use our online contact form to send us a quick email with any questions and queries you may have. We will get back to you as soon as possible, answering your questions with tailored advice to suit your needs.